I'm having breakfast right now .... hash browns in particular. I just thought I'd point out a good product to pack away in our trailers. Its called "Golden Grill Hashbrown Potatoes" and is sold by Costco. For around $6.00 you get 8 cartons of dehydrated shredded potatoes in what looks like a pint sized milk carton. Each carton provides enough hashbrowns for at least 2 people (carton claims enough for 7 people ... naaaaa I likes me hashbrowns). What I like is that first of all: they taste good, price is pretty inexpensive, no refer required - long term storage, and small durable packages that can be easily stored. Perfect for our trailers. I am going to be looking for those, love hash browns.Thanks. Just in time, Tom. My wife just went to Costco, and will check it out. Thanks. (Now, if we could just find an equiv. deal for bacon!). Breakfast, at noon. Must be a slow work day, Tom. 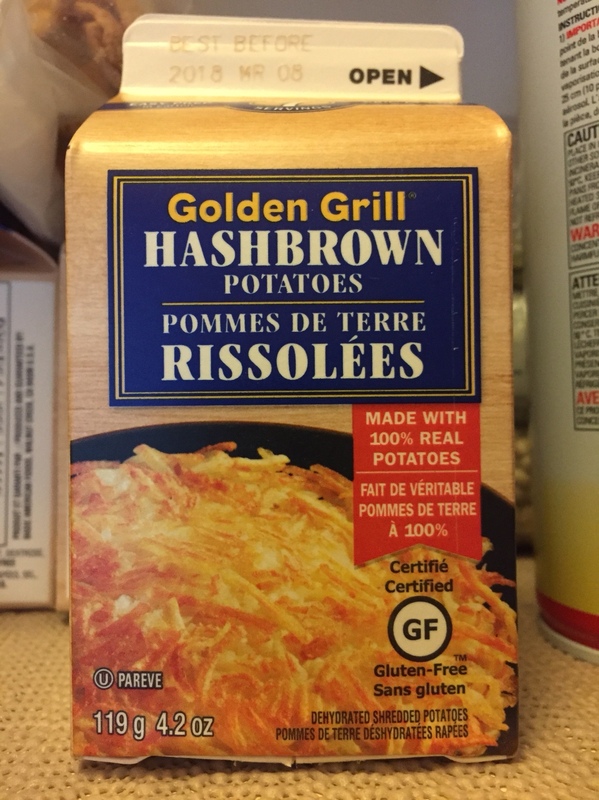 When I was in high school the restaurant I cooked at used these type hash browns, and rehydrated were always a favourite as you could fry them nice and crispy. Not sure if Costco here has them, but we will look. Can you still get the Salt and Pepper Pistachios at Costco in the US. We always have some of them around the house - simple to make, inexpensive and tasty. The hash browns will be part of the menu selection when we are camping. When I was a kid many, many years ago, our family always took canned items along because we camped in tents or tent campers, no refrigerator. One of my favorites was DAK brand canned bacon. It was not appealing right out of the can but once fried up, very good. Unfortunately, I have not seen DAK canned bacon in years - just their hams which I do not like. There is a Yoder's canned bacon on the market but I have never tried it. Lucky you guys. They had them here, but haven't carried them in a few years. Tom left me most of a bag at the 2016 rally, and we picked up 3 bags when at the Fall NOG last year, but now I must wait until my next trip south.